Why modify your Hi-Fi Digital and Analog equipment? price point and use low costing grade parts. Why should ASi modify your existing Digital Source? 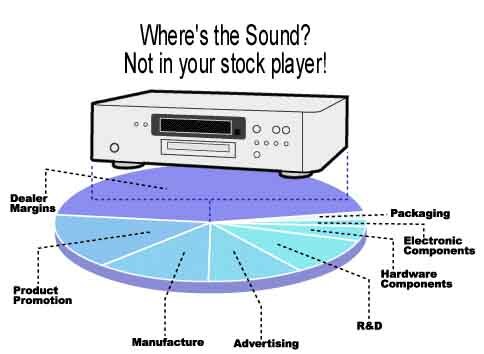 of your existing Hi-Fi component will equate to far better sound! and you save many thousands of dollars, its that simple!). does one choose? What path does one take? New? Used? Modifications?… Help!!! constantly change as we discover more through increased resolution. <---- This is the sound!! problem with our AC mains worldwide causing more bad sound then you can possibly fathom. grade silicon types, which are noisy & slow and ringy. piss poor digital power supply. conductor for the power to pass! better sound due to lower impednace and faster conductance. was a better quality fuse inside than stock. completely remove the glare, grain and hardness/harshness from the music! dynamics, transparency, detail, tonal purity, depth, definition and a quieter background. If the circuit requires regulation, a simple 78XX or LM317 type regulators are not enough. improve the sound and the video! $500- to $20,000+- regardless of manufacturer or model. and video recording and playback, Period. profound effect on the music and video. The effect of a clocking upgrade is like adding a supercharger to your car! We feel the analog output stage of any player or DAC is the most important. This is the primary area where most music gets “lost” or becomes “compressed” and “lifeless”. capacitors, signal pathway transistors and relays and other nasties. the ear because music sounds compressed with filtering. Execute summation and amplification with transformers (if the circuit allows). ~Removes all signal pathway parts such as resistors, coupling capacitors, transistors, etc..
~In Dual Differential designs (most players), allows for TRUE BALANCED XLR OUTPUTS!!! ~Very low impedance, and higher output voltage lead to better system flexibility. ambient detail and a super huge sound stage that is balanced and live sounding!